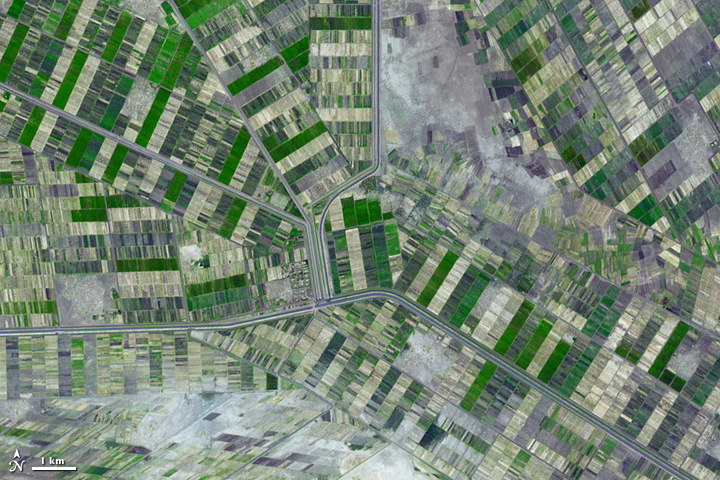 South of Khartoum, Sudan, where the White and Blue Nile Rivers join, a dizzying arrangement of irrigated fields stretches out across the state of El Gezira. Given the semi-arid climate of the surrounding area, this geometrical spectacle of fertile green fields depends on thousands of kilometers of canals and ditches that connect the region to the Blue Nile in the west. The manmade rivers and streams are part of an irrigation project called the Gezira Scheme, which the British started in the colonial era to grow cotton for export back to Europe. The area shown in this scene is about 15 kilometers (9 miles) north-northeast of the city of Al Mansqil, and it is nearly 60 kilometers (37 miles) from the river. Several bare-looking patches (bottom center, lower left corner) are small villages, while the large bare patch north of image center appears to be open land that has either been abandoned for crop growing or has yet to be intensively cultivated. A field with a purple tinge at upper right may be flooded. This image was captured by the Advanced Spaceborne Thermal Emission and Reflection Radiometer (ASTER) on NASA’s Terra satellite on December 25, 2006. NASA image provided courtesy of NASA/GSFC/METI/ERSDAC/JAROS,and the U.S./Japan ASTER Science Team. Caption by Rebecca Lindsey. 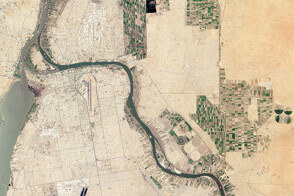 South of Khartoum, Sudan, where the White and Blue Nile Rivers join, a dizzying arrangement of irrigated fields stretches out across the state of El Gezira. 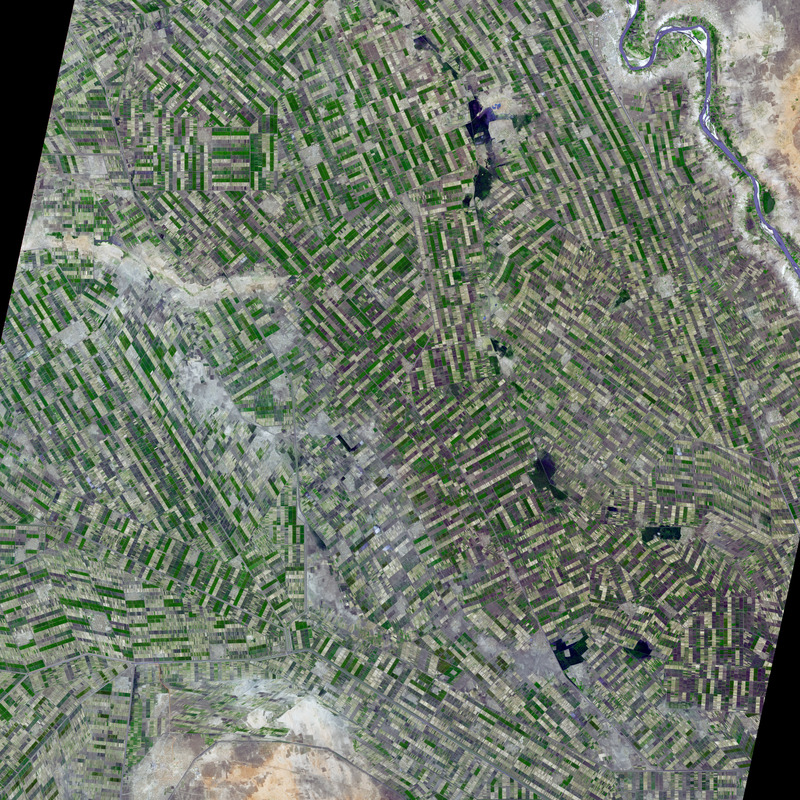 Given the semi-arid climate of the surrounding area, this geometrical spectacle of fertile green fields depends on thousands of kilometers of canals and ditches that connect the region to the Blue Nile in the west.